Plant scientists have taken the crucial last steps in a 60-year quest to unravel the complex chemistry of Madagascar periwinkle in a breakthrough that opens up the potential for rapid synthesis of cancer-fighting compounds. The team in the laboratory of Professor Sarah O'Connor at the John Innes Centre have, after 15 years of research, located the last missing genes in the genome of the periwinkle that are devoted to building the chemical vinblastine. This valuable natural product has been used as an anti-cancer drug since it was discovered in the 1950s by a Canadian research team. 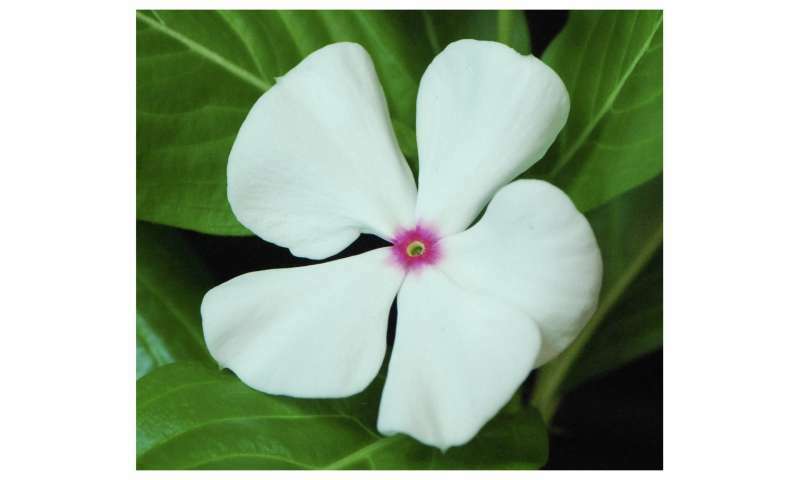 A potent inhibitor of cell division and used against lymphomas and testicular, breast, bladder and lung cancers, it is found in the leaves of Madagascar periwinkle (Catharanthus roseus). Until now, the complex chemical mechanisms the periwinkle uses in the production of vinblastine have not been fully understood. Consequently, access to its life-extending chemistry has been laborious—it takes approximately 500 kg of dried leaves to produce 1g of vinblastine. But the new study—lead author Dr. Lorenzo Caputi—which appears today in the peer-review journal Science, uses modern genome sequencing techniques to identify the final missing genes in the pathway. This research also identifies enzymes that build vinblastine precursor chemicals, which include catharanthine and tabersonine. These can be readily chemically coupled using synthetic biology techniques to give vinblastine. "Vinblastine is one of the of the most structurally complex medicinally active natural products in plants—which is why so many people in the last 60 years have been trying to get where we have got to in this study. I cannot believe we are finally here," said Professor O'Connor. "With this information we can now try to increase the amount of vinblastine produced either in the plant, or by placing synthetic genes into hosts such as yeast or plants." Its attractive white or pink flowers have made the Madagascar periwinkle a popular ornamental plant in homes across the world. But for decades it has been the focus of increasingly competitive research probing its natural chemistry and potential pharmacological activity. Professor O'Connor also pointed out that this new study builds on the work of numerous other research groups around the world who contributed to the elucidation of the vinblastine pathway over the years. Having assembled the genetic pathway and the formidable chemical structures, the team are now in a position to use the information to create more compounds much more quickly using synthetic biology techniques. Professor O'Connor anticipates that her group or another in this competitive field will be able to produce microgram quantities of vinblastine or its precursors vindoline or catharanthine in the next 12 to 18 months. The John Innes Centre team were joined in the research by the Courdavault group based at Tours, France. They employed modern sequencing and genomic techniques along with some traditional chemistry relying on a blend of intuition and some literature dating back to the 1960s and 70s. In total the team counted 31 steps in the chemical chain from the primary chemical precursor to the final product, vinblastine. One molecule in the chain so volatile that Dr. Caputi came to know it as "angry-line" instead of its true scientific name dihydroprecondylocarpine acetate. 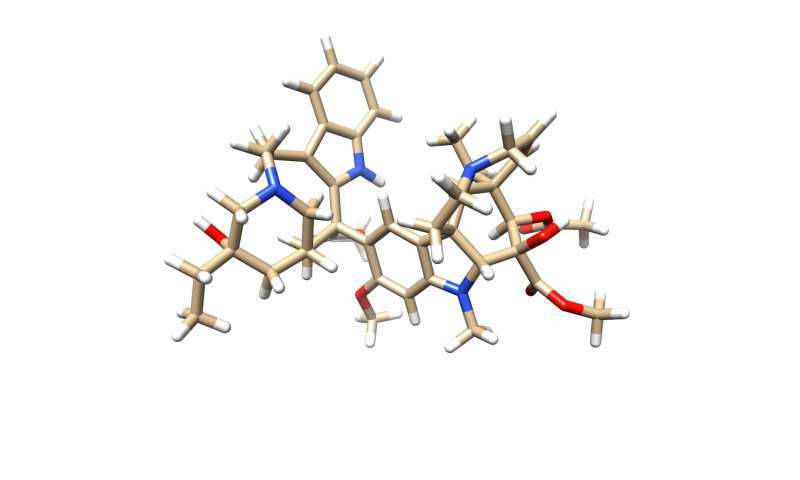 The full findings can be found in the paper: Biosynthesis of the Vinblastine and Vincristine Precursors, Caranthine and Tabersonine, in the journal Science.